It is now officially the first week of March, and we keep talking about the need to take down our Christmas tree. We still turn on the tree lights every night, and enjoy the festive glow that it provides as we eat our dinner and watch TV. Fluffy keeps saying, "Well, I guess we need to take down the tree this week," and I agree with him. But then he puts it off for another day and I never complain, because I'm enjoying it too. By this time you are probably thinking that we have one of those fake trees, but you would be wrong. In fact, the reason it will eventually come down is that it is becoming more of a fire hazard each day. But all things considered, it is only looking slightly droopier than the day it was first put up. In fact, other than the fact that it’s a fire hazard, the only problem with the tree is that now that the branches go downward, the ornaments are starting to roll off the branches and land with a thunk on the floor. Those thunk sounds surprise us, and we are too old to be startled. Nasty things happen when old people get startled. For one thing, they might choke on their teeth. Also, I am afraid that some of our ornaments might break. After carting some of our Christmas ornaments in my lap home from exotic places, I would hate to have them end up in pieces on the floor because they slid off the branches of the Christmas tree because the branches were pointing downward because they no longer were perky enough to point up. 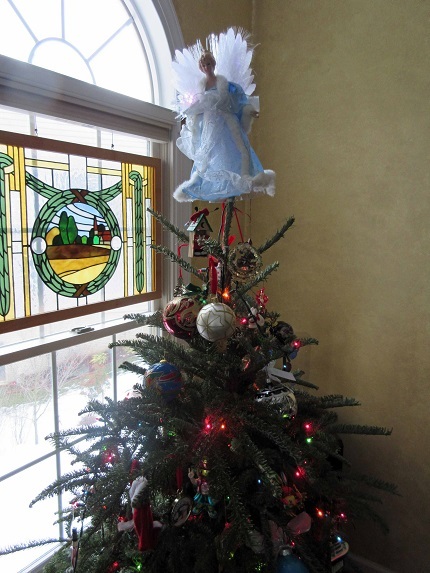 Fortunately, the tree sits on top of a protective rug, so most of the time the fallen ornaments don’t break. Between church activities and friends, we have lots of people come to visit us — people who might be a little taken aback by the Christmas tree in our family room. Just this week we had the Relief Society book group meeting in the same room as the tree. No one made any comments, however, having gotten used to the fact that, well, the Kidd family is just a little bit strange. The thing is, everyone we know is used to our leaving our Christmas decorations up as long as is humanly possible. We may take down our tree in March, for example, but the wreath on our front door stays up until it falls down. And the wreath inside on our stairway stays up (I should be embarrassed to say this) until the friend who makes our wreaths needs the ribbon to make next year’s wreath in December. Yes, it is true. I have no shame. But Fluffy and I like Christmas. We like the music. We like the decorations. We like the food. We like the way Christmas makes us happy. We want to hold onto that for as long as we can. And if that means we listen to Handel’s Messiah year-round and keep up our indoor live Christmas wreath until December (long after it is technically not alive anymore), well, that’s our prerogative because it’s our house. We have noticed something interesting in this year of 2015, however. Usually, Fluffy and I are alone in leaving our Christmas decorations up way into the New Year. But this year, we have seen many holdouts as we have looked into windows on our street and beyond. This year, we will not be the last people in our town to take down our Christmas decorations. Maybe it’s the cold. Maybe it’s the bone-chilling “global warming” that has done everyone in, here in the Washington, D.C., suburbs and along the East Coast. We have gone far past seeing our breath when we talk. We have been so cold this winter that feeling comfortable is a dim memory. Fluffy is outside shoveling snow as I write this. Children have a snow day off school today and tomorrow, and even the federal government is closed, which means the temple is closed. We are socked in, snow-wise, even though spring is allegedly just around the corner and temperatures are predicted to be in the fifties just next week. But even though snow days like this are rare, the rest of the winter has been bone-cold. Even indoors I have been so chilled that the only time life is bearable is when I am swaddled in a blanket, with a shawl around my shoulders, and Fluffy on one side and a space heater on the other. Then I feel toasty, but only until Fluffy gets restive and leaves me so he can do something else. I don’t know what people do who do not have a Fluffy and a space heater. Maybe they are the other ones whose Christmas trees give them that psychological warmth. There is something about a Christmas tree that says “happy.” When the summer sun is shining, people don’t need that extra boost. Now, in the dead of winter, we need that extra reminder, so Christmas decorations are staying up longer than normal. Christmas gives us a frame of mind that human beings need as much as we do food or water. We think kindly of others as we wonder what gifts to buy for them, and as we wrap and deliver, or even as we make those gifts. We do good deeds. We make elaborate or not-so-elaborate dinners that we share with others. The bottom line is that we spend time with the people we love, or the people we should love. We look for the good in each other, and we celebrate that good in a way that we may not do during the rest of the year. As we make all these Christmas preparations, the side-effect is that most of us are happier than we are at any other time. We bask in the joy of Christmas, but then the day passes and then all too many people pack up the Christmas spirit with their Christmas ornaments at the end of December. As soon as the trappings of the holiday are put away, it’s business as usual again. We have friends who put their Christmas tree out on the curb promptly on December 26th. Some of us have a hard time letting that joy go. We are the ones with Christmas trees that are still glow warmly into January and February and even into March. We would still be taking gifts to others, but the recipients would get that uncomfortable feeling that maybe they should reciprocate, and that’s the last thing we would want them to do. In a world with so much sorrow and suffering, it may not be bad to wish that the warm feelings associated with Christmas might extend through the rest of the year too. Tonight when I go to bed, Handel’s Messiah will accompany me up the stairs. And even after the Christmas tree is taken down, I hope that Fluffy and I will live in a Christmas house this year.